In this tiny building many classic Golden World, Ric Tic and Wingate sides were produced. Berry Gordy was so impressed by the quality of the owners output, that he bought out Ed Wingate and Joanne Bratton in September 1966. It looks like the sale of the Ric Tic label was delayed until 1968. 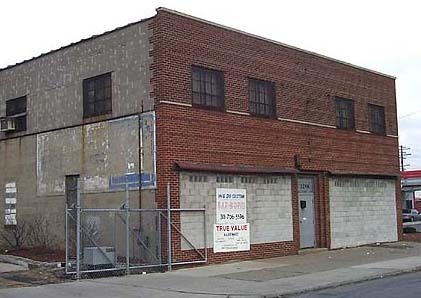 The premises then became Motown Studio B and a blue and white sign confirming this was painted on both sides of the building. On my first visit in 1998, I missed the sign. Thankfully my wife spotted it while sitting in the taxi! As you can see, the elements have all but erased the evidence. Former drummer, George McGregor, recalls that a sign hung across the wall above the entrance proclaiming The Golden World Recording Company. Two large windows sat on either side of the main door. Behind the left hand window was the office of Joanne Bratton. At the rear of the building, on the ground floor, was the recording studio and control room. The ground floor also housed Ed Wingate's office, a mastering lathe room, a tape library and rehearsal rooms. There was also an extension at the back left of the building which housed the echo chamber. Arthur Ashford, of The Precisions, recalls the employees putting into a tin can at lunch breaks in this room! The second floor was used for storing records etc. Ed Wingate also used his home on Edison to administer the Ric Tic label after the sale of Golden World to Berry Gordy.